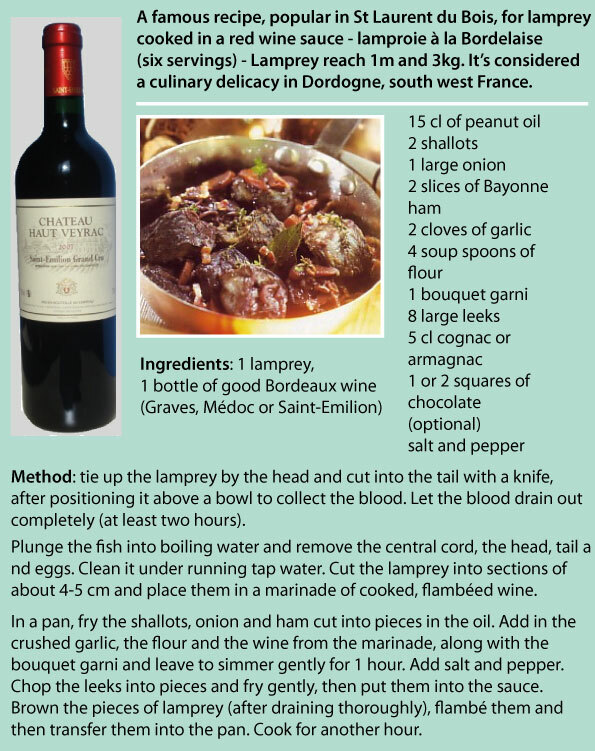 Help to choose which wine to buy, to accompany sea bass, trotu and lamprey recipes. 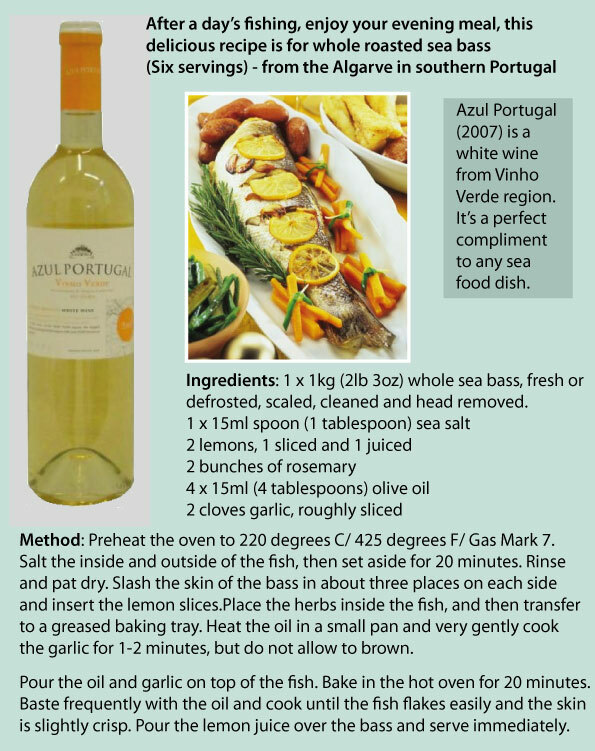 I've recommended a bottle of red or white wine that will complement each fish dish shown below. The fish I've included are brown trout, octopus, eels, lamprey (not strictly a fish - it doesn't have a jaw bone) and sea bass - your "catch of the day". 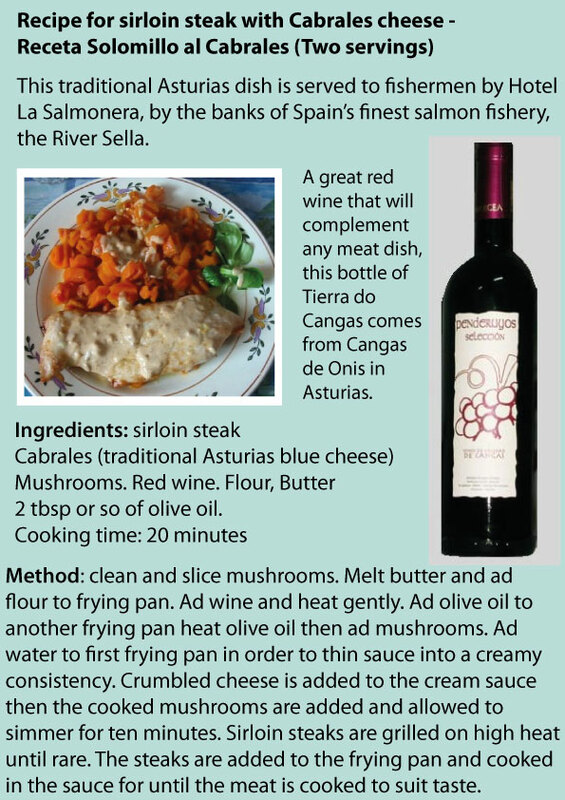 For meat lovers, I've included a superb Northern Spain dish - sirloin steak, covered in Cabrales blue cheese from Asturias. 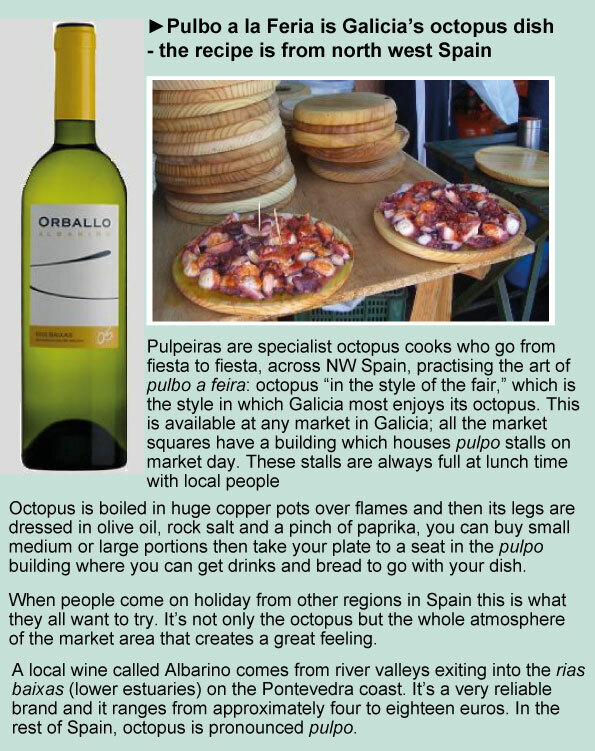 These delicious recipes, from Spain, France and Portugal can be downloaded onto your PC or hand held device, for free and printed out at home. 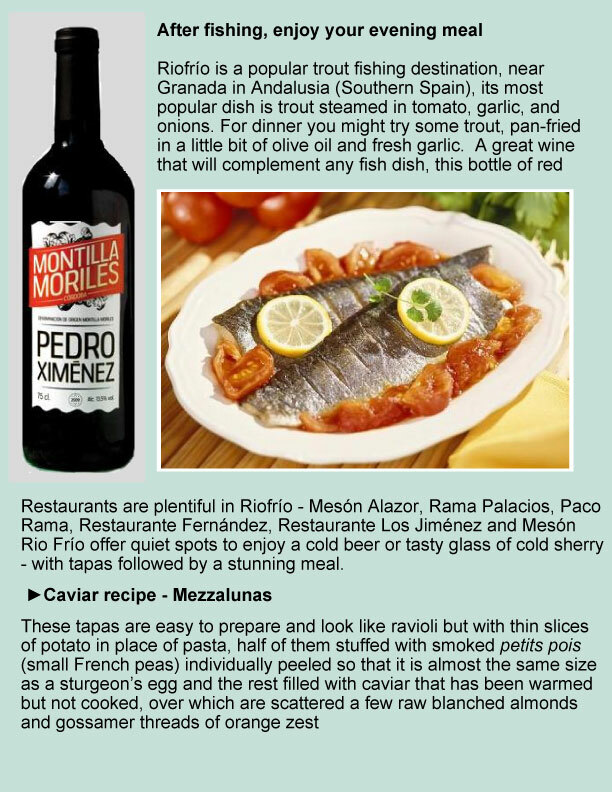 Details of how and where you can catch these fish, using the ingredients mentioned below, are found in my fishing guide books for Spain, France and Portugal. handful of fresh parsley, chopped, bit of fresh basil, 2 lemon wedges, pack of gulas -baby eels, one piece dried whole cayenne pepper , sea salt and pepper to taste, 2 tbsp or so olive oil (Cook time: 20 minutes) Method: sauté the garlic and onion together in olive oil for a few minutes. Once soft, add chopped tomatoes, parsley, basil, salt and pepper. Cover and let simmer on medium for ten minutes or so, until tomatoes are soft. 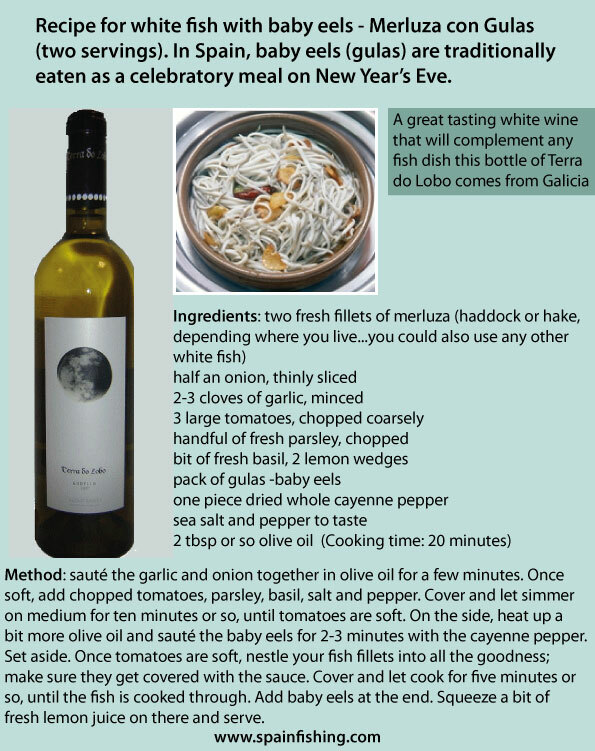 On the side, heat up a bit more olive oil and sauté the baby eels for 2-3 minutes with the cayenne pepper. Set aside. Once tomatoes are soft, nestle your fish fillets into all the goodness; make sure they get covered with the sauce. Cover and let cook for five minutes or so, until the fish is cooked through. Add baby eels at the end. Squeeze a bit of fresh lemon juice on there and serve.